2012 could be a rocky year for Russian gas exports, at least if events in the last half of 2011 were any indication. 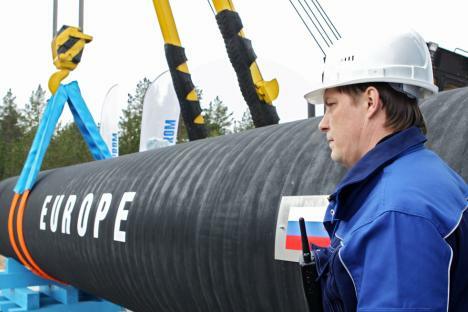 By December, the prophecy of Gazprom head Alexei Miller had come true – the price of Russian gas to Europe had climbed to $500 per thousand cubic meters. But for Gazprom, which had hoped for such a price for years, the situation isn’t exactly the stuff of dreams. As it turns out, the faster the price goes up, the tougher the Russian gas major’s negotiations with its European buyers become. The EU’s Third Energy Package, which was once purely an industry discussion, has become a hot political issue. Russian gas supplies to Europe have been a matter of dispute and political negotiation for many years, yet only in 2011 did the European Union take the unprecedented step of formally accusing the Russian company of monopolizing the market – and raided its offices. Gazprom had often heard such accusations in Russia, where it sells gas at bargain prices, but not in Europe, where the monopoly is used to only one thing – making money. In addition to raiding the offices of Gazprom, the European Commission also raided the offices of the gas company’s biggest customers: the major lobbyists of the monopoly’s interests in the EU, who are more heavily dependent on Gazprom deliveries than any other players. This decision made it clear to everyone that the rules of the game were changing: From now on, the purchase of Russian gas will be accompanied by problems. Both Gazprom management and the Russian authorities were stunned by the move. Russian energy minister Sergei Shmatko said he was very surprised that EU energy commissioner Günther Oettinger did not call to warn him that Gazprom was to be searched, but it was hardly worth waiting for such a courtesy from the official, who had been criticizing Gazprom’s policies in the EU since the spring and refused to grant Russia preferential treatment in implementation of its project to build the South Stream pipeline under the Black Sea to Europe. In order to resolve or at least mitigate these problems, Moscow has tried using proven political tools, but so far they have had little effect. German Chancellor Angela Merkel, one of Russia's key allies in continental Europe, said that extra gas was not needed in Germany, even though nuclear power is being phased out in that country. Vladimir Putin has openly asked for support from his French counterpart François Fillon, but in Paris, the issue of gas supplies is not particularly important, since 90 percent of France's power is generated by nuclear power. There is, of course, room to maneuver. For example, the French could be given a contract to build a new high-speed railway from Moscow to St. Petersburg for their support, yet so far there is no confidence that any of Russia’s European partners will step up. Additionally, the Russian Ministry of Energy has tried to negotiate with Qatar, a major Gazprom competitor in Europe, as well as other gas suppliers. But none of the parties have promised anything of material value to Moscow. Now the situation is at a deadlock. The subtleties of European energy legislation, as evidenced in the Third Energy Package, are under scrutiny and remain an open issue. None of the suggested solutions provide any comfort to Moscow, but European government officials are only sluggishly threatening to reroute gas supplies from Europe to Asia. In 2012, Moscow will have to look for new tools to use in its negotiations with the EU, but this will be done against the background of an unexpected strengthening of Azerbaijan's position as a future alternative supplier of gas and Turkey as the future key transit country for European gas. Russia will have to reassess its arguments, and also perhaps its allies. First published in Kommersant Daily.